In the middle third of the mandible in a dentate adult. In the lower third of the mandible in a child. In the upper third of the mandible in edentulous patients. In the sagittal plane a.k.a. mesiodistal orientation. In the vertical plane a.k.a. 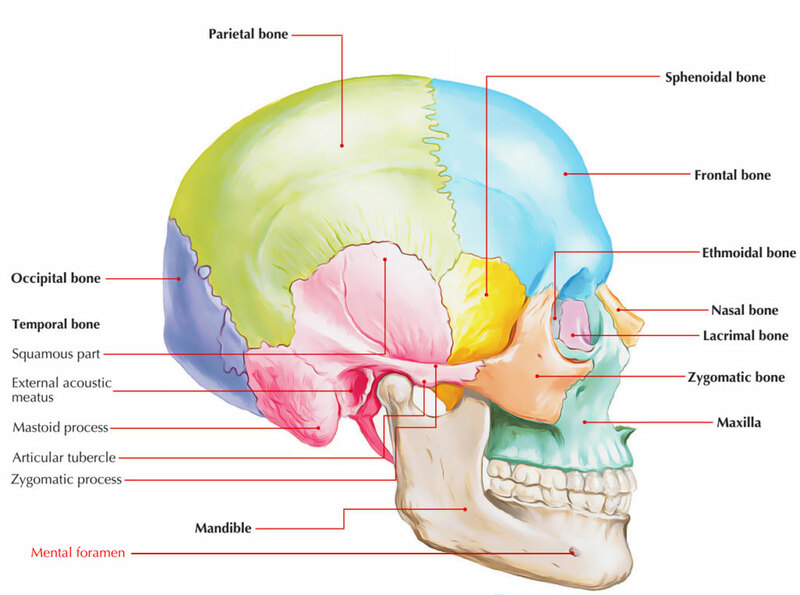 craniocaudal orientation. The mental foramen is always located lateral towards the adjacent roots, if a tooth is malpositioned with its root piercing the buccal cortex within the axial plane (mediolaleral orientation). Mental nerve that is a branch of inferior alveolar nerve. Mental artery which is a branch of inferior alveolar artery. Mental vein which is tributary of inferior alveolar vein. At birth, it is found under the sockets for deciduous molar teeth nearby the lower border. In an adult, it slowly moves up and opens midway in the middle of the upper and lower margins. In old age, because of resorption of alveolar process of the mandible due to loss of teeth, it is located near alveolar border. The traumatic neuroma of mucosal surfaces is a smooth-surfaced submucosal nodule of the mental foramen area, the lateral tongue, along with the lower lip. The lesion is slightly more common in females than in males and can arise at any age but is most frequent in middle-aged adults. It can appear following tooth removal or other surgery in the jawbones, or can occur in oral submucosal tissues.